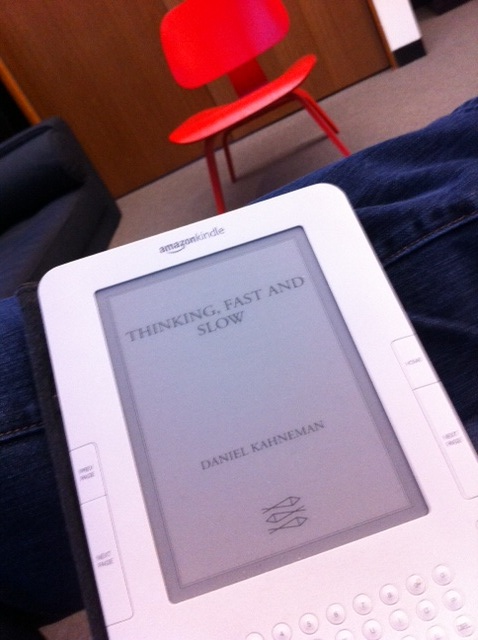 Over the holiday break, I finished up Daniel Kahneman’s new and much-praised book Thinking, Fast and Slow. I consider it quite an achievement, and by that I mean both the book itself (a deep, personal, and introspective look back at the career of one of the most important psychologists of our time) and my actually reading it (the book weighs in at almost 500 very dense pages). Here is me thinking fast, but reading slow. One of the many interesting things about Dr. Kahneman is that, as a psychologist, he actually won his Nobel prize in economics. If you are interested in learning more about how that happened, go here. Over the last few months, Kahneman’s book has been sitting near the new Jim Collins book Great by Choice in the rarefied air of Amazon.com’s top 100 books list (I reviewed Great by Choice a few months back here). So I thought it was interesting that Kahneman challenged Jim Collins and his book Built to Last in Chapter 19. It was a pointed attack not just on Collins but the entire genre of success story-inspired business books. Since I spend quite a bit of time reading these sorts of books, I was really interested in his viewpoint. I mean, have I been wasting time reading that I could just as usefully spent watching reruns of Tosh.O or Arrested Development on TV? Is there real value in studying successful businesses and leaders or is it just an illusion? So are we to believe Kahneman and Rosenzweig? Is there really no value in studying the leadership and management practices of great companies? Okay, I get it. Kahneman views me as a sucker. And who am I to argue with a Nobel Prize-winning psychologist? But I just can’t help it. I think there is plenty that we can learn from the lessons of innovative businesses like those that Collins profiles in Built to Last. Kahneman may be right that these books suffer from an illusion of academic rigor that breaks down under close study. And yes, they probably need a disclaimer (“The author makes no promise or guarantee that if you follow the principles outlined in this book you will become Google overnight. Individual results may vary.”). But what these books lack in academic rigor they make up for in one simple area: they inspire people. To not settle for what they see today. To try something new. To learn. To grow. To believe. So in that sense, Kahneman’s critique is somewhat akin to an adult telling a three-year old child that there is no Santa Claus. My view? The analysis is technically correct, but emotionally bankrupt. Where success story business books fail the analytical brain, they often are just what the emotional brain needs. So I don’t know about you, but I’m going to keep on reading business books. By constantly refueling my head with new ideas, I’ll always have something to learn and try. I’ll continue to be inspired by authors like Jim Collins, by companies and leaders who have seen great success, and I’ll suspend my academic doubts in the hope of learning new lessons that might just work. I’d love to hear what you think. If you believe Kahneman’s critique of Collins and the genre is on the money, or if you believe instead that there is still value in sharing and learning from business success stories, let me know in the comments section below. Actually, I will have to side with Kahneman here. I have not read the book, and the reason for it is that I got greatly disillusioned by reading a number of business books based on success (or failure) stories, such as Collins’. Each time, after finishing another acclaimed tome, I felt like I have learned nothing actionable, yet spent time being entertained by anecdotes and parables. While the inspirational part is certainly important, without true knowledge and intelligence, inspiration can lead to failure just as easily. The promise of the success-story-based business book is to tell the reader how to repeat the story, not just to inspire to try. This is where they have so far fallen disappointingly short. And this is why I do not read them anymore. Yeah, I don’t disagree with you here… these books do often fall short of giving you the things you need in order to repeat the story– if that is in fact possible at all (Kahneman would say it is mostly luck anyway). But I still feel that there is something there along the lines of “Those who cannot remember the past are condemned to repeat it,” i.e. learning from history. Perhaps we learn more from the specific stories than from the broad generalizations though? Would you find reading something like the Steve Jobs bio valuable? Or would that fall into the same boat as these other success story business books for you? I am a sceptic by nature, and when I hear “inspiration” my mind says “reality distortion.” In most anyone else but Steve Jobs, singular focus, inflexibility, and authoritarian approach to leading a company would be criticized and pointed to as reasons for failure. His leadership style goes against nearly ALL of the leadership books I have read or heard of. Yet somehow the same people to say that collaboration is key to all innovation can also believe in the lone genius of Jobs. What I am trying to say here is, that each story is selected to illustrate whatever idea the author wants to. Stories (and inspiration) thrive on simplification and idealization, not on knowledge and rational thought. Which is fine, but not a good basis for making business decisions. Leaving business success (if that is what you seek) to “luck” is, to me, like buying a lottery ticket, quitting your job, and sitting on the deck while you wait to hear you have won. Luck fhas always favored the prepared. Do I think there is an element of luck or “divine providence” in the success stories of most people or businesses? Sure. However, as a business person, I enjoy reading business books, including ones on the success of others. I have never read one I actually thought was a “how to” for my personal or business success (even though the cover may have said that – or promised it). I’ve also rarely, if ever, read one from which I didn’t gain some piece of useful information. Read enough, put enough information together from all that you’ve read – you probably develop your own game plan for success (again, if that is what you seek), because what resonates with you/moves you is what you will remember and use. I am skeptical by nature of anything that claims to be “the answer” or “the plan” – it just isn’t that easy. Success is not a formula, but there are elements of what others have done/wish they hadn’t done that are helpful to know more about. So, I’ll continue to read business books, novels, biographies, children’s books, and more . . . enjoy the reading and gain what I can. And if some luck comes my way, a bit of divine intervention, a bit of “in the right place at the right time,” I hope my knowledge and hard work have put me in the place to appreciate it. 1/ That we analyse success retrospectively through rose coloured glasses. The comments on Steve Jobs above resonate on that basis. Plenty of businesses that have gone badly have been blamed on autocratic micro- managers. 2/That a lot of the writing around this area is dressed up as research and reinforced by describing the masses of data analysed which is irrelevant if the method is not scientific and rigorous. 3/That telling inspiring and emotional stories that illustrates a point that is actually not true is at best disingenuous and at its worst the method of charlatans and con men. 4/ That even if the analysis is good (and I think a lot of it is not) then it is historical and we need to think differently about the future. Phi Rozenzweig does make the point that Jim Collins gets paid a lot more to talk to companies and conferences than he does!! In the end you cannot study these sorts of things in quite the same way as true scientific method (which is my background and training). That means that we should recognise the weakness and be extremely cautious about any conclusions we adopt or spend time and energy on.